Associated Press writer Blake Nicholson reported on Saturday that, “Drought in North Dakota is laying waste to fields of normally bountiful food and hay crops and searing pastures that typically would be home to multitudes of grazing cattle. Some longtime farmers and ranchers say it’s the worst conditions they’ve seen in decades — possibly their lifetimes — and simple survival has become their goal as a dry summer drags on without a raincloud in sight. 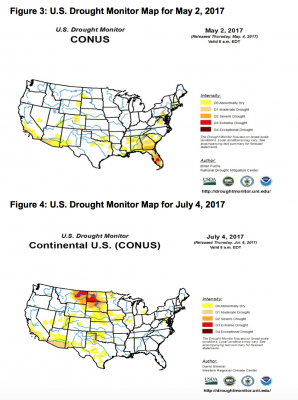 “Areas of Moderate Drought (D1), Severe Drought (D2), and Extreme Drought (D3) expanded across eastern Montana, North Dakota, and South Dakota where hot and dry conditions continued as well as reports of declining crop conditions and hay shortages. 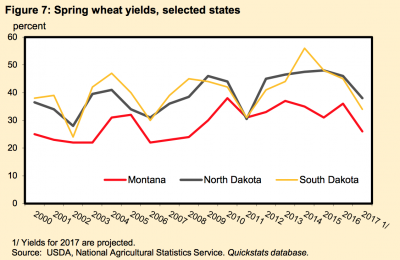 In South Dakota, ‘soybeans statewide are showing thin stands, slow growth, and small size for this time of time year’ according to the South Dakota State University (SDSU) Extension. 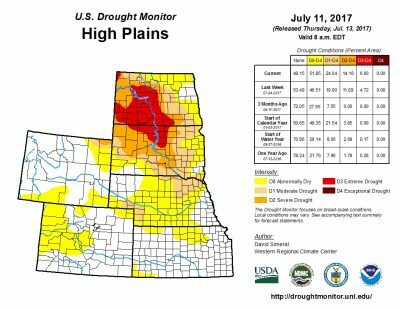 In North Dakota, small grain crop failures are being reported as well as reports of producers selling off livestock.” U.S. Drought Monitor, July 13, 2017. 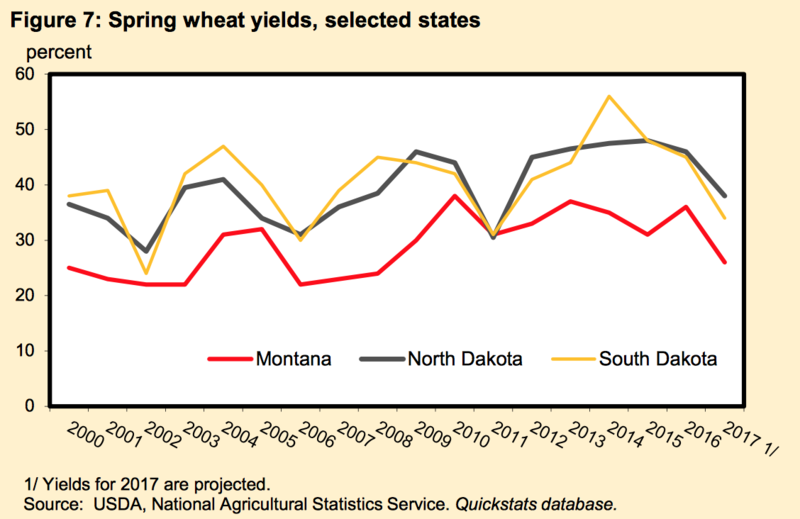 With respect to drought conditions and wheat production issues, the USDA’s Economic Research Service (ERS) indicated on Friday in its Wheat Outlook report that, “Challenging growing conditions for Other Spring and Durum wheat in the Northern Plains are reflected in lower yield projections, cutting 2017/18 U.S. production by 64 million bushels this month, to 1,760 million. As a result, U.S. wheat exports are projected down 25 million bushels from June, to 975 million, and imports are raised 10 million bushels to 14 million. Foreign wheat supplies are projected higher, and a shift in the export shares of major exporters is likely. Russia is projected to become the top world wheat exporter for the first time in history. “Figure 3 shows the limited area affected by abnormally dry conditions as of May 2. 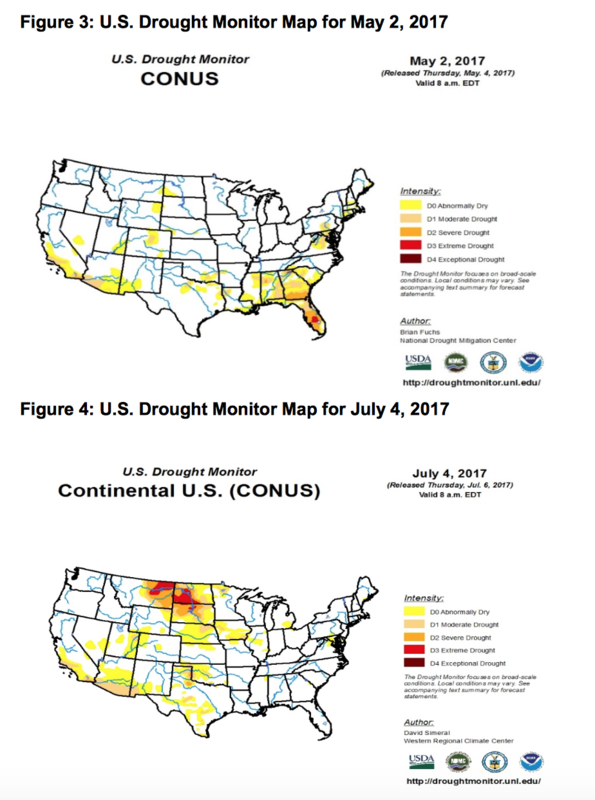 Over the next 2 months, dryness persisted, and by July 4, large sections of North and South Dakota and Eastern Montana are shown to be in severe to exceptional drought (Figure 4).” (Wheat Outlook/WHS-17g. July 14, 2017, Economic Research Service, USDA). Spring Wheat Yields. (Wheat Outlook/WHS-17g. July 14, 2017, Economic Research Service, USDA). If rains do not resume soon, many producers will need to liquidate herds, move cattle to other regions, or buy hay (or other supplemental feeds) from distant locations at high cost. “Because of poor crop conditions in much of the region, a larger share of planted acreage is likely to be grazed out instead of harvested for grain, adding to forage supplies. The nutritional value of distressed crops is compromised, so they could also be of limited value.” (Feed Outlook / FDS-17g /. July 14, 2017, Economic Research Service, USDA). Meanwhile, with respect to the drought and corn, Sara Bertsch reported on Saturday at the Grand Forks Herald (N.D.) Online that, “July makes or breaks corn. “That’s what Scott Stahl, of Emery [S.D.] has heard countless times from his dad, uncle and many other ‘old-timers’ who’ve seen the worst of the worst drought conditions. 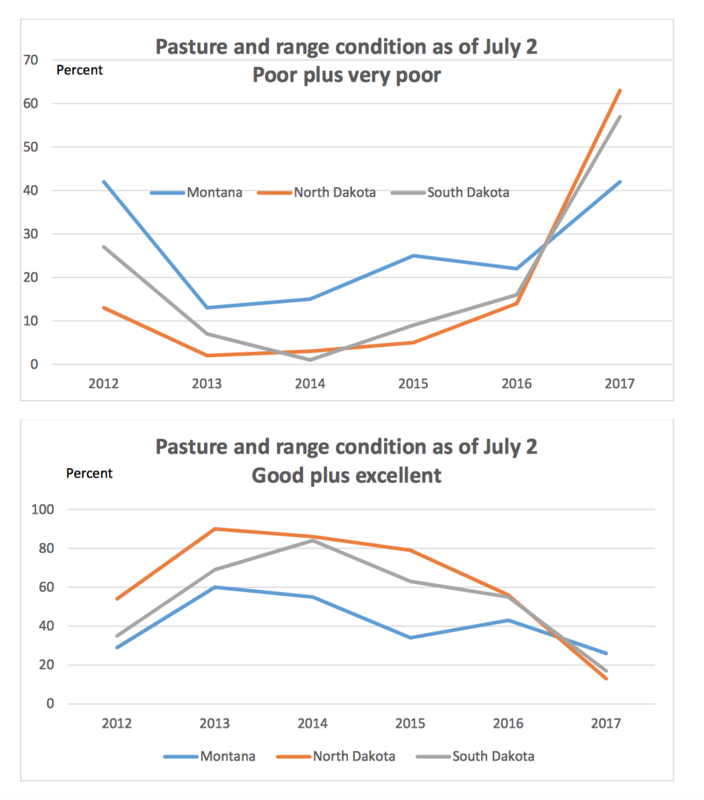 The article noted that, “But these next two weeks aren’t looking good for South Dakota farmers. “According to Laura Edwards, the state climatologist, it’s ‘going to be tough’ as the next two weeks are projected to likely be above average temperatures and drier than average. And Nick Lowrey reported last week at the Capital Journal (Pierre, S.D.) 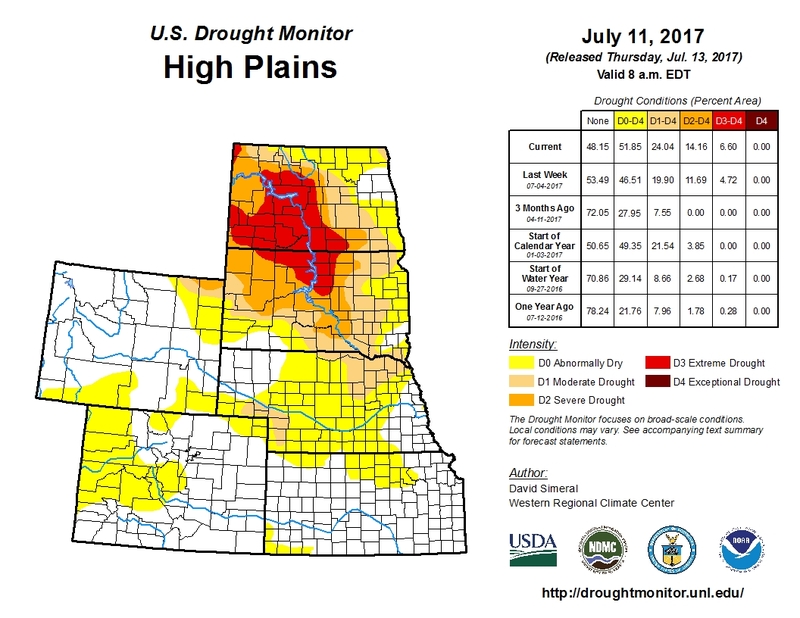 Online that, “Farmers and ranchers won’t be the only South Dakotans hit hard by the drought conditions found throughout the state. Hunters, too, likely will feel the pinch this fall. Last week, the Federal Reserve Board released its February ’17 Beige Book update, a summary of commentary on current economic conditions by Federal Reserve District. The report included several observations pertaining to the U.S. agricultural economy.